The Harligold Macaw is a very pretty bird with a double dose of the intelligent, gentle natured Blue and Gold Macaw! Because hybrid macaws are a mixture of more than one type of macaw, the offspring are influenced by the traits and characteristics of both of its parents. Father's have the dominant gene, so this will generally influence the offspring's coloration and overall appearance. Crossing the Harlequin Macaw with the Blue and Gold Macaw can make for a 'double dose' of the Blue and Gold's wonderful qualities. The Harligold Macaw inherits its gorgeous coloring from these two striking parents and is strongly influenced by the Blue and Gold. The behavior and temperament of hybrid macaws are more unpredictable and uncertain than the coloration. Harligold Macaws are a hybrid parrot that are very attractive with the intelligence and temperament of its parents. The pet Harligold should be quite trainable, learn to talk and do tricks, and have an amiable nature. These beauties can be a very affectionate, inquisitive, and fun companions. As with all macaws, they will require good socialization and consistent training to make good pets. The Harligold Macaw is a second generation hybrid macaw. It is a cross between a Harlequin Macaw hybrid and a Blue and Gold Macaw Ara chloroptera. 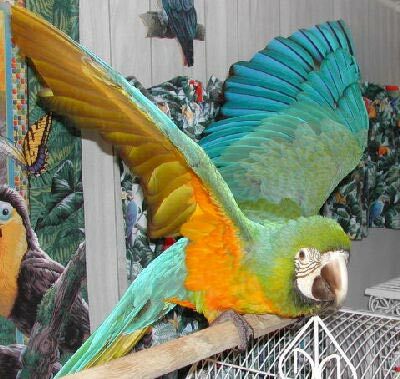 Harligold Macaws are a very attractively colored macaw hybrid. Both parents of the Harligold Macaw contribute to the colors of their offspring, though the father's have the dominant gene and this will influence their final appearance. One of the Harligold parents, the Harlequin Macaw, may bring a strong Green-winged Macaw influence into the mix. This is because the father of a Harlequin Macaw is most often a Green-winged Macaw (male Green wings are more common than females). Some of the characteristics when sired by a Green-winged macaw will be a large bird, brightly colored, with the head and beak shape more typical of the Greenwing. With its other parent being a Blue and Gold Macaw, it gets a double dose of the softer blue and gold coloring. The mixture in this bird makes for beautiful pastel blue-green colorings on its upper parts, contrasted with vivid orangish reds on its under parts. Harligold's are a full size Macaw and can learn to talk with a general vocabulary of about 15 or more words and expressions. The Harigold Macaw typically takes on the sweet friendly side of the Blue and Gold with some of the natural clownish personality of the Harlequin Macaw (the word harlequin is defined as 'clown'). The result can be a very good natured and intelligent pet bird. They are a typical macaw. Can be cranky at times and may even be a one person bird or only like men or women unless well socialized. To have a well rounded bird that enjoys more that one person, make sure it is well socialized with lots of folks. I absolutely adore my Harligold 'Kokomo'! We hand .raised him from the day he hatched. (I owned his parents) He is 7 mos. Old now and so beautiful, lovable & fun! This bird has personality plus and then some... Loves to cuddle and play, but definitely not afraid to let you know when he isn't pleased... Lol. He is a wonderful addition to our family! I am about to adopt my first baby Harligold Macaw. The father is a Harlequin and the Mother is a Blue and Gold. I am so excited! I have been hand raising macaws for many years. My favorites are the Harligolds. They are so playful and lovey dovey. Very talkative, they learn fast. They like to cuddle and give kisses. Their feather colors are different In each of them-truly beautiful! They will walk from their cages to the bedroom and climb into bed and lay on their backs cuddled up with me watching TV. I have several other varieties of macaws, too. There is less macaws that aren't brother, sister or aunt , uncle in breeding these wonderful birds. So we will have some kind of macaw in the usa for pets. I would rather breed pure breed. Look at the green wing about gone. Because breeders are unable to get non related birds. Related birds give us sick and insane birds. Would you rather have zero birds it's close if we don't breed hybrids. You say they are bred for color? They are bred strictly for the money. These hybrids should not be happening and only disreputable breeders are doing it. My opinion.